Modeling the molecular processes of biological cells is a craft and an art. Techniques like theoretical and computational skills can be learnt by training, but meaningful applications are achieved only with experience and sensitivity. The Theoretical and Computational Biophysics Group offered a workshop, attempting to teach both the craft and art of modeling through learning by doing. 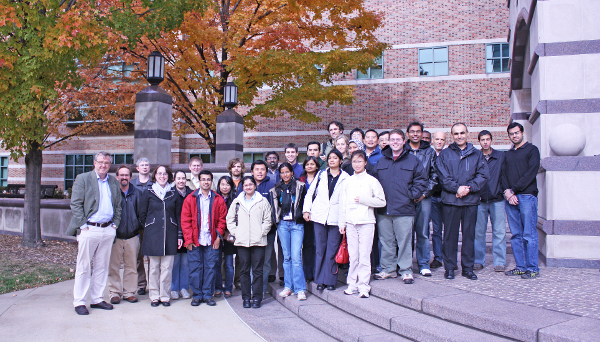 A total of 28 participants attended the workshop at the Beckman Institute for Advanced Science and Technology on the University of Illinois campus. Participants learned how to stretch proteins, pull water through molecular channels, mine genomic data, and study biomolecules. After lectures and discussions in the morning, afternoons were devoted to hands-on computer laboratories where participants delved into 700 pages of tutorials, on laptops humming with computational biology software, e.g., VMD and NAMD. Workshop supported by NIH P41-RR005969 "Resource for Macromolecular Modeling and Bioinformatics". Contact Us // Material on this page is copyrighted; contact Webmaster for more information. // Document last modified on 18 Feb 2013 // 9281 accesses since 28 Jul 2010 .